Leading up to the Super Bowl, my mom said she dreaming I scored a touchdown. I told her that it was just a dream because I played with Fitzgerald, Boldin, Breaston, Hightower and Edge … there was no way I would touch the ball being a seventh round, second year Tight End. In practice, we put in and a practiced a goal line play designed to go to me but I figured it was beyond a long shot. Then in the second quarter, we hit Boldin on a 50-yard pass play and that got him down to the one-yard line. I panicked on the inside because I knew they would call my play. Sure enough, they call the personnel package for me to go in and Kurt calls the play. 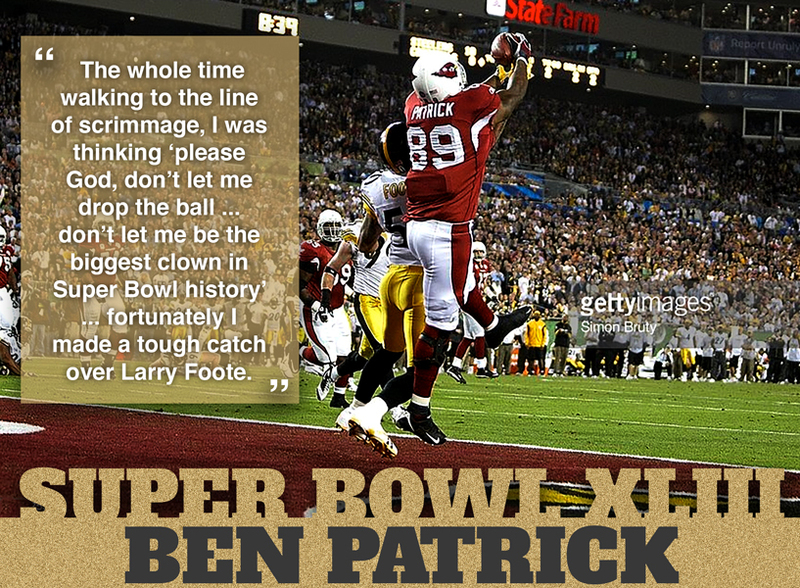 The whole time walking to the line of scrimmage, I was thinking “ please God, don’t let me drop … don’t le me be the biggest clown in Super Bowl history” …and fortunately I made a tough catch over Larry Foote.